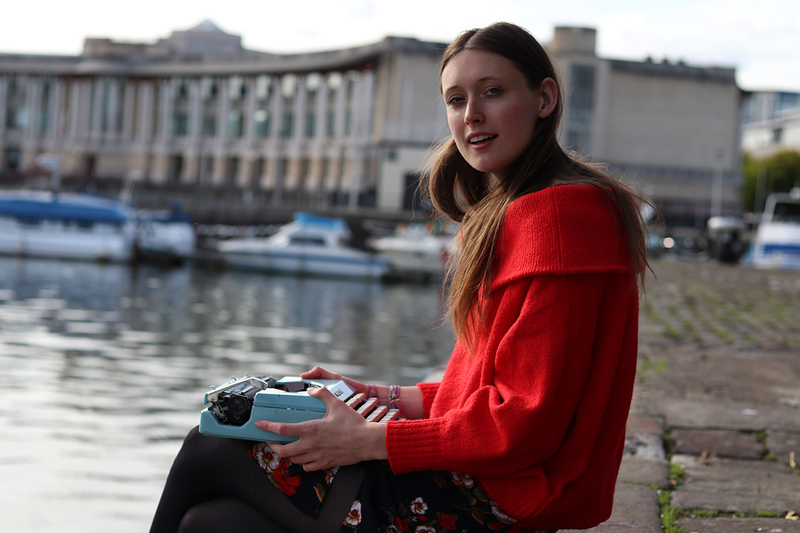 Beth Calverley is a 24-year-old spoken word poet and a business woman. She is the chief operator of The Poetry Machine, her own creative enterprise she has been running for almost three years. 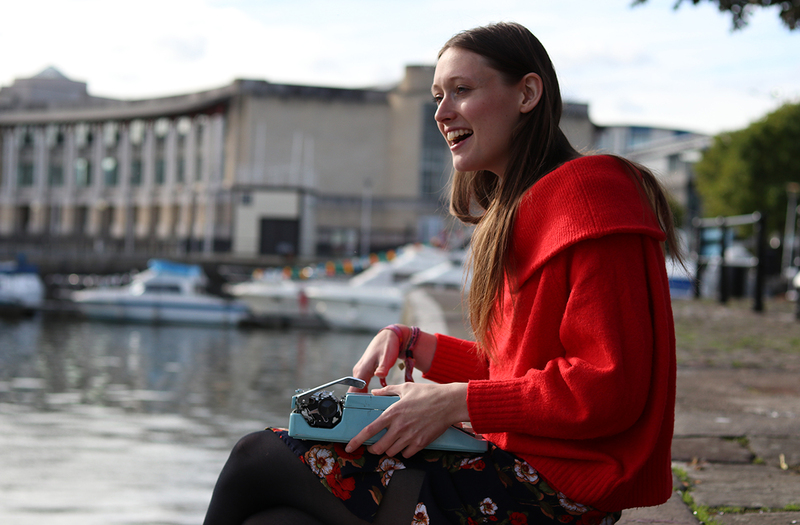 She is also part of the team that runs Milk Poetry, a popular Bristol spoken word event. 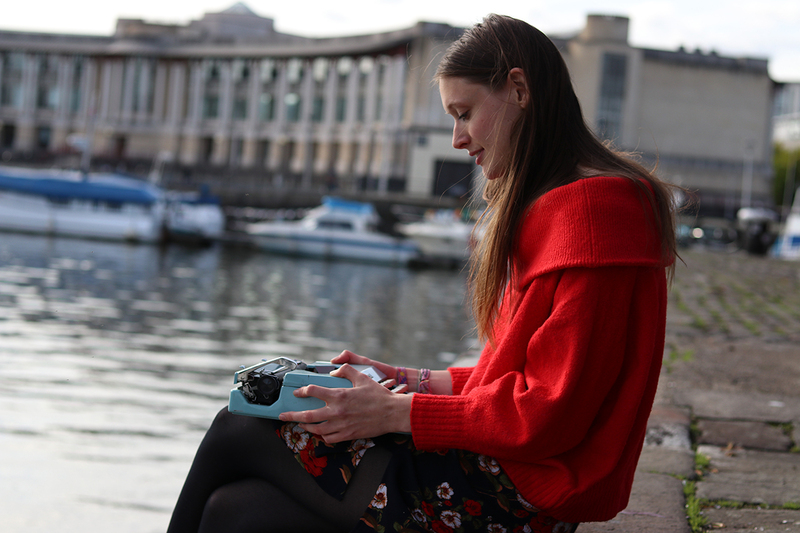 We got together with Beth to chat to her about her passion for poetry, using poems as gentle activism, going freelance and how she operates her own business. How did The Poetry Machine begin? I went to Leeds University and founded the spoken word society. We got asked to do a project at a festival on campus celebrating different cultures that lots of different people from all walks of life can all participate in. 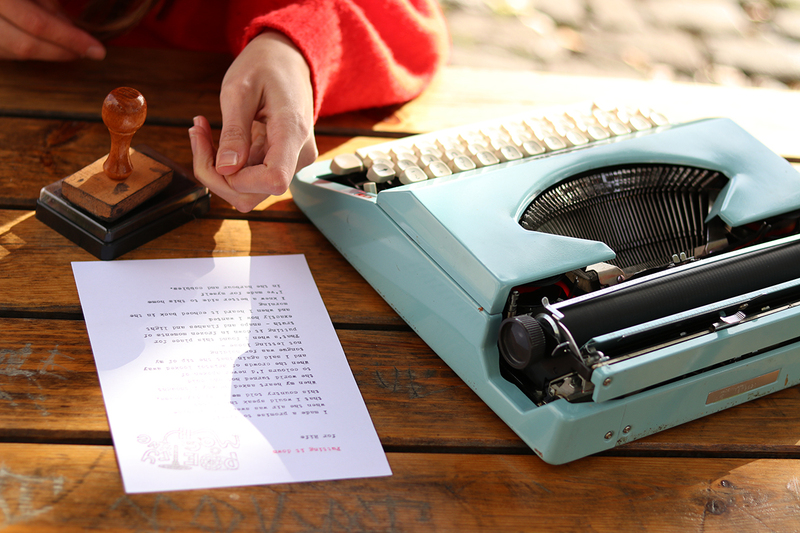 I had a really gorgeous 1800s typewriter at the time, so I took any excuse to use it really. That was the first time I tried the Poetry Machine, and it went so well. How does The Poetry Machine work? 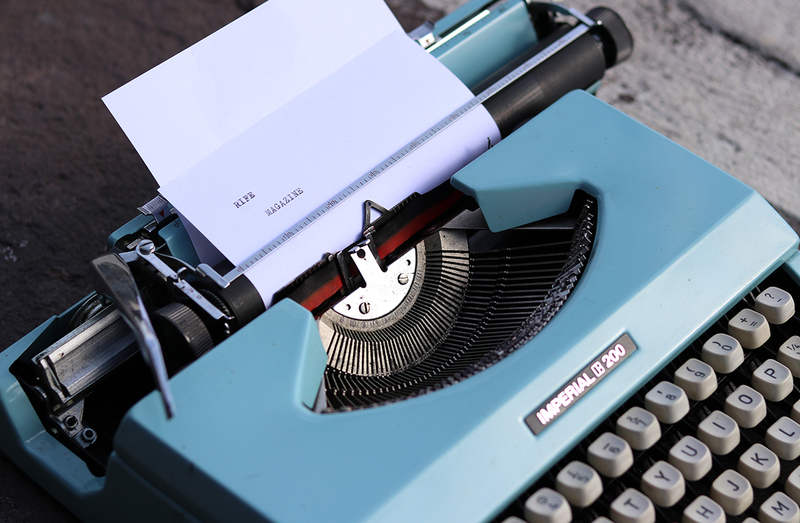 I go to events with my typewriter and people give me a word. 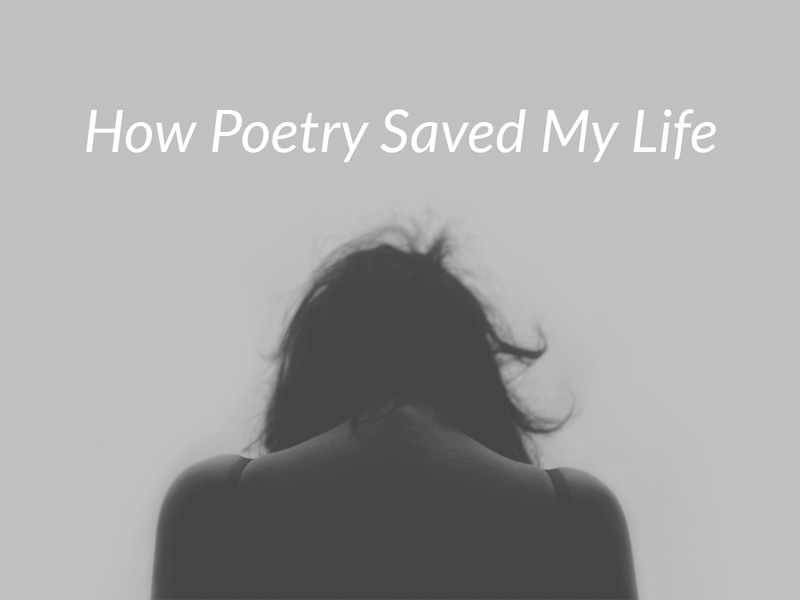 We chat for a few minutes, then I write a poem that’s specifically crafted for them. Then they can take that home with them, so it can either be a gift for someone, or it can be a keepsake for themselves. I tour that around at parties, festivals, weddings, all different kinds of events. Another element is workshops with different groups, charities, corporate groups and team building days. I really like working with people who have maybe never written before, or maybe thought that they never could. That’s a key driving force for me, to help people connect with poetry who might otherwise not have opportunity to do so, and help people put into words what they are struggling to say. …to help people connect with poetry…put into words what they are struggling to say. I also do video campaigns with poetry narratives, and online bespoke poetry. So, around Christmas time or Valentine’s day any special occasion, people can go onto my website and they can order poems to be delivered. Can you tell us a bit more about the video campaigns? We’re in the golden age of video storytelling at the moment, so the best way to connect with an audience is through video. But a lot of the time you get quite generic language being used in videos, nothing that really gets to the heart. I work with organisations to put a message into words in a way that’s really authentic and true. I’m working with This Mum Runs [on their] FullStop campaign. 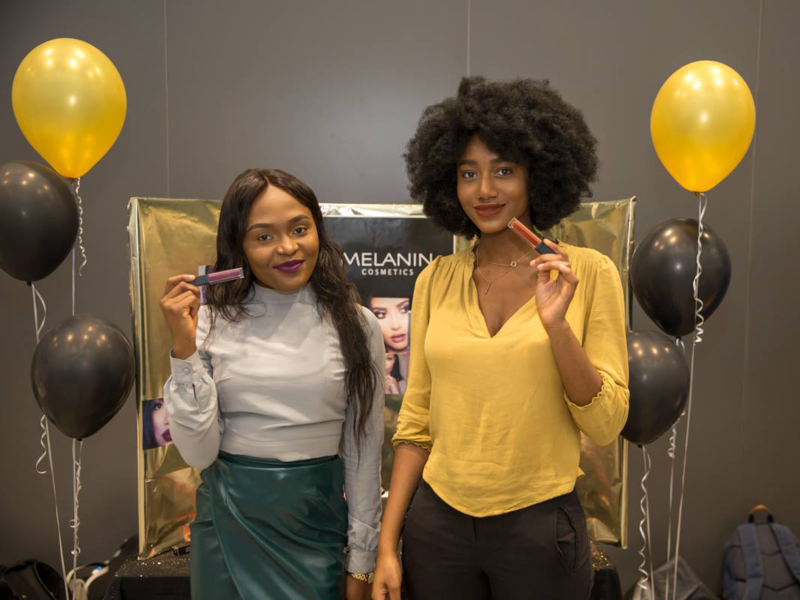 The first three videos are out and the launch video gained 40k views on Facebook. The campaign was presented at Cannes Lions, a big advertising [festival] in France. The best thing of all is that women all over the UK are contacting This Mum Runs to say how this has inspired them. 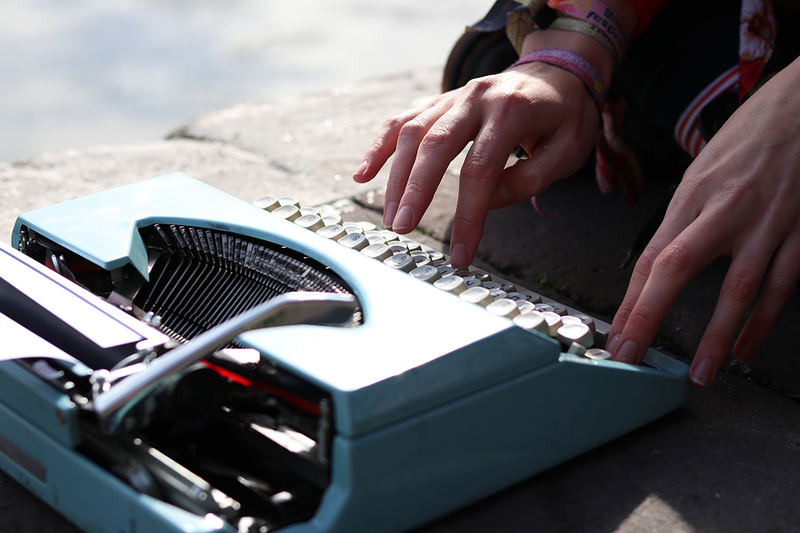 You recently went freelance with The Poetry Machine, how is it going? It’s at a really exciting phase now because I’m focusing on it full time. I started writing and performing my own poetry when I was 7, so it’s been a 17-year journey. I think one of the reasons why it’s so exciting is because when you’re a young creative, and when you’re very little, people ask you what you want to be when you grow up, and you say a writer, which is what I always said. People are like, ‘aw that’s sweet’. Then you start to get a bit older and people stop thinking it’s quite so sweet, and start thinking it’s a little bit too ambitious. You know there’s that slight element of like, people want to look after you by suggesting you do something more practical? But being able to just go for it like this and be doing professionally the thing I’ve always wanted to do, is such an amazing feeling really. 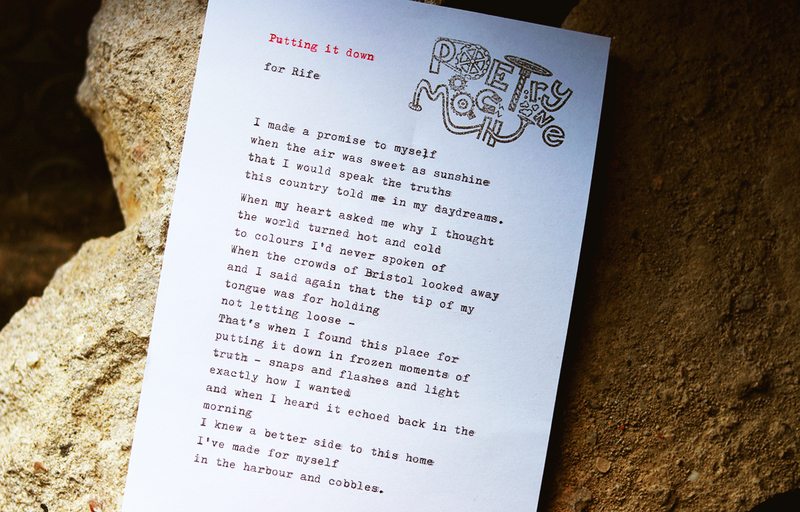 What are your favourite memories or moments from The Poetry Machine? When I’ve done The Poetry Machine live, I’ve had people with different abilities being able to connect with The Poetry Machine and get a poem. So people that are non-verbal have had a poem from me, which is really cool. At WOMAD, someone who used to go for morning runs around the festival site in previous years came up to me in a wheelchair. It was a really challenging time for her. It was like the rest of the world didn’t exist right then. It was just the two of us. We got a poem about the future and looking forwards and moving into her new way of being. It was quite empowering, and by the end of it we were both in tears. Quite often people will cry at their poems, and when I cry as well that’s when I know something special has happened. When I cry that’s when I know something special has happened. What would you say are the biggest challenges? It can be quite a weight of responsibility. There was one father recently who was having quite a rocky relationship with his step-daughter. He was thinking and speaking about it from a very frustrated place. But when we got the poem, it became evident that he was feeling from a very emotional, sad place about it. He clearly had changed the way he was thinking about [their relationship] and so that can be a real weight of responsibility for me. I never find out exactly what happens to [the poems]. They go off into the world and then they have their impact. On a practical level, the pricing of things. When people are paying say, for a 10-minute set of spoken word, they’re not paying for ten minutes, they’re paying for 17 years of honing your craft. Poems that no one else has written. They’re paying for the impact it’s going to have on the audiences. I think for creatives, it’s important that we all band together and don’t undercut each other. What’s the daily operation of The Poetry Machine like? How do you balance the business side of things with your creative work? I really love the business side of things. I really enjoy building relationships with different organisations, doing the website, emails, social media. It’s a lot to learn, but it’s fun. You’re selling what you want to be selling. In terms of how I structure my day, I have this really useful tool called a Self-Journal. You basically set the next 13-week goal, the different things you want to achieve by the end of it. Then you split them up into daily tasks, as well as three goals you’re going to achieve each day. If you keep track of what your goals are, you can review them. If you haven’t met them [that’s fine] and you can understand why not. I make sure to plan in a specific amount of creative time per week versus the business side, so that I’ve always got enough work coming in, but not spending so much time doing the selling that I don’t have time to write the poems. It’s really given me a huge amount of confidence knowing that what I have to say is just as important as anyone else. 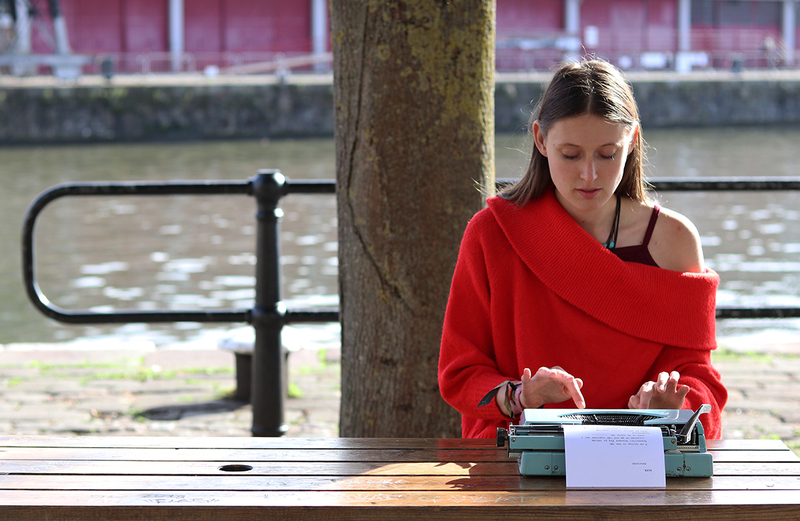 How do you think working on The Poetry Machine has affected you? Has it change the way you interact with people? I’ve always had a strong sense of empathy, but I would definitely say that doing The Poetry Machine has heightened that. I’ve become more interested in other people and their stories. Over time I’ve become quite intuitive. I only have this short chat with people to be able to get a kind of essence of what they’re trying to say. Poetry in general has given me so much confidence. When I was growing up I was really painfully shy and found it quite difficult to speak in public, let alone when I’m the only person speaking. It’s really given me a huge amount of confidence knowing that what I have to say is just as important as anyone else. More recently focusing on [The Poetry Machine] and realising that I can make money doing it as well, has been again another boost. It’s amazing to believe in yourself, to know that you’re your own safety net. It’s wonderful to know that you’re enjoying working freelance because it can be quite a daunting experience. Yeah, it can be. But I’m really lucky because I come from a line of women who are quite successful in business. My Nanny, she didn’t go to university, she had a really tough start in life but she started working on the shop floor and ended up running her own business, just through her own courage really. My aunties are all successful women in business. And my mum, she’s hugely supportive in what I’m doing. She’s a business coach. So, when I’m doubtful I’m quite lucky that I can be like, ‘mum, I’m worried about this’ and she’ll be like ‘no you’re fine, keep going’. And that’s all you need really, someone to say you’re fine, keep going, believe in yourself. It doesn’t need to be a mum, it could be a friend or yourself. Every hurdle that you overcome, every time you manage to overcome your own self-doubt, is one hurdle that someone else wasn’t able to overcome. And you just keep going. Who are your creative and entrepreneurial inspirations? Spoken word poets I look up to creatively are Tom Sastry, Melanie Branton, Joelle Taylor, Sarah McCreadie, Jasmine Gardosi, Malaika Kegode, director of Milk Poetry, Sally Jenkinson, Amy Leon. They all have a totally original and authentic voice which I really value in poetry. In terms of page poets, Seamus Heaney is a real hero of mine. Favourite poems [are] Larkin’s High Windows, Seamus Heaney’s Digging, Matthew Arnold’s Dover Beach, Wendy Cope’s Differences of Opinion. In terms of non-creative inspirations, I’ve mentioned my family. I’m also reading How to be a Craftivist: The Art of Gentle Protest by Sarah Corbett. I saw her do a talk at Hay Festival this year, and I thought she was totally amazing and bought her book. She’s a professional activist and she does it through craft. One thing that she says is, if you’re going to raise awareness of something, it’s really important to have some call to actions of what people can do. [Because if] you don’t explain how people can go about making changes in their own lives, you’re actually disempowering people. So now if I’m doing a poem, say on mental health challenges, I try to give ideas on how people can go about [changing] their own lives. Everyone has their own truth, their own perspective. Why do you write poetry and why is poetry important to you? I feel very strongly that poetry is for everyone. A lot of people think they can’t do poetry. What I say to that is, poetry is just listening to the world, thinking about the world, and writing it down from your own perspective. Everyone has their own truth, their own perspective. It’s really precious. I think that’s really important in a world where more and more it’s about assimilation and surface rather than about what’s underneath. I think people are crying out for truth. They want to be able to say their own truths and be heard, and they want to listen to other people’s truths and understand. And I think poetry really makes that possible. That’s why the message that I follow in my work is: tapping into truth. What advice would you give to young people who want to be more involved in poetry, or want to set up their own creative venture? Obviously, I’d say come to Milk Poetry. It’s warm, it’s friendly, it’s a huge family basically. We meet every third Monday of the month at The Room Above. The whole idea is to get the most established names in spoken word performing shoulder to shoulder with brilliant new poets. 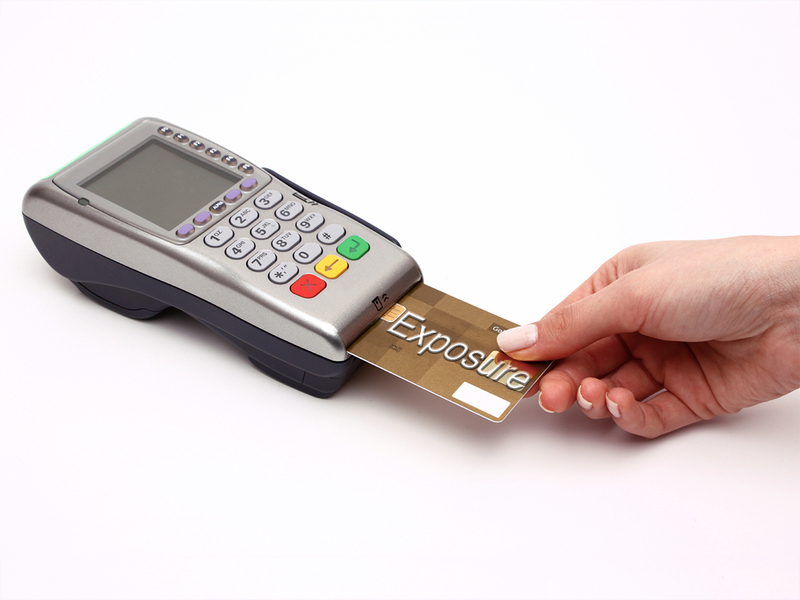 If you don’t feel a little uncomfortable with what you’re charging, you’re probably not charging enough. In terms of the business side of things, The Prince’s Trust is a programme I’m on, and I’m really excited to start their Enterprise programme soon. It takes you through all the different aspects of honing your craft, setting up as a legal vehicle, sales and marketing and the financial stuff. Then you get mentoring and a chance to apply to funding afterwards, so it’s a really good programme. There’s also Knowle West Media Centre’s Factory programme, which supports makers who want to borrow different pieces of equipment and use their facilities, and get support in lots of different ways. Spike Island have their creative enterprise programme, they do bursaries, advice, workshops and stuff like that as well. Some really good advice I’ve had: if you don’t feel a little uncomfortable with what you’re charging, you’re probably not charging enough. Creatives always feel a bit more uncomfortable charging than anyone else, because that’s how you’re brought up to think about your work. It’s really important to be paid what you’re worth, so that you can continue to make amazing work. I’ll be doing The Poetry Machine in hospitals in October. It’ll be for families visiting their loved ones, staff members… so that’ll be really special. I work with Arnos Vale Cemetery quite a lot. Each year I’m part of their Life, Death (and the Rest) Festival, celebrating life but also talking about death, which I think is really important. 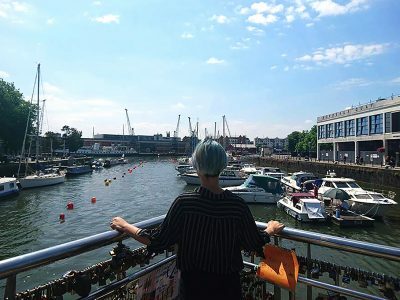 I’ve just finished the debut performance of a show we’re hoping to tour called Rational Creatures, [where] six female spoken word poets around Bath and Bristol were commissioned to write a piece of poetry based on a different Jane Austen novel. Mine was Mansfield park. It’s all about how her heroines are people we can learn from and also look up to, with flaws as well as shining traits. They’re not this mythical idea of what a woman should be. So, the show is a celebration of that. This time leading up to Christmas is a really busy time for me with the online commissions. People like getting authentic Christmas presents rather than just the same old stuff. They can get a bespoke poem written specifically about someone, framed and delivered to their house. It’s quite an easy thing to do, but also really impactful. At the moment I’m a sole trader. So, my long-term aim is to set up as a Community Interest Company. Which means I’ll be formalising my philosophy and intention to operate in the community’s best interest. You’re committing that all the funds in the company are used to benefit and keep the CIC going, rather than to help you go on big holidays around the world. That’s what I’d like to do eventually. The bigger picture is… knowing that I’m doing good in the world. I believe in poetry for a purpose. The idea of how I’m building my business is, I ask commercial side to contribute a bit more so that I can do more discounted and free workshops and events for charities and community groups. Balancing the charity side of things with the commercial side. But the bigger picture I think, is knowing that I’m doing good in the world. To be set up in such a way, so that I can look in the mirror in the morning and be like, ‘yes I am using poetry as a tool for good’. It hasn’t been a straight-line journey for me to get where I am. I had lots of other jobs beforehand. We all have to put in the graft and do things we don’t necessarily want to do in order to get to the point where we can then focus on it. And I wouldn’t be in a position to do what I’m doing if I hadn’t done that. And you’re never too young to do it. The younger you start, you have more time to build it. It’s about finding that balance, don’t give yourself a hard time if you’re not quite there yet, but also if you are ready to do it, don’t stop yourself because you think you can’t. Working for exposure is no way to live your life.